We have chosen our winners for the Brigham's Sundae-in-a-Box Giveaway! Thank you to everyone who entered and if you didn't win, don't worry, you can still head over to Brigham's to vote for the flavor you'd like to see make a comeback as well as share your favorite memories and enter for a chance to win a Brigham's ice cream scoop! Winners will be notified by email with instructions on how to claim your prizes. A big thank you to Brigham's for sponsoring the giveaway and Happy 100 Years! "It's a good base for toppings." "It's a mild, generic coffee [flavor]." "It's great with hot fudge." "It doesn't even really taste like coffee, which is a good thing because I generally don't like coffee flavored anything." "I liked it. It wouldn't be my first pick, but I'd eat it." By the way, after complaining that two of my stores only had limited flavors, today I stopped at a more local store and hit the motherlode. It was all I could do to not buy all of the flavors. I settled on Paul Revere's Rocky Ride. I'll report back when I try it! Don't forget, only one more day to vote for your favorite retired Brigham's flavor for a chance to win one of ten prizes of a Sundae-in-a-Box from Brigham's! I brought Brigham's Mocha Almond for my husband. I wasn't expecting to like it, but like all ice cream, I'll try it. Clearly, it was well loved by my husband. And he's true to his word. He ate a lot of it! Would I buy it again? For me? No. (There are just other flavors I'd prefer.) Would I steal some from my husband's carton? For sure! Don't forget to vote for your favorite Brigham's flavor to return to production! I told you in yesterday's post that there were very limited Brigham's flavors when I went to the store, and almost the same (limited) flavors when my husband went to a different store. However, coupon in hand, my husband thought he should get me something. Since we already had two of the flavors at home, and he wanted something a little more exciting than chocolate or the other vanilla, he had Salted Caramel Crunch and Peppermint Stick to choose from. I am not sure he knows me too well. He brought home the Peppermint Stick. While I like mint chocolate chip, the idea of Peppermint Stick does nothing for me. And every Christmas I try to be all festive and eat a candy cane. And I hate them. The trooper that I am when it comes to ice cream, I tried it. 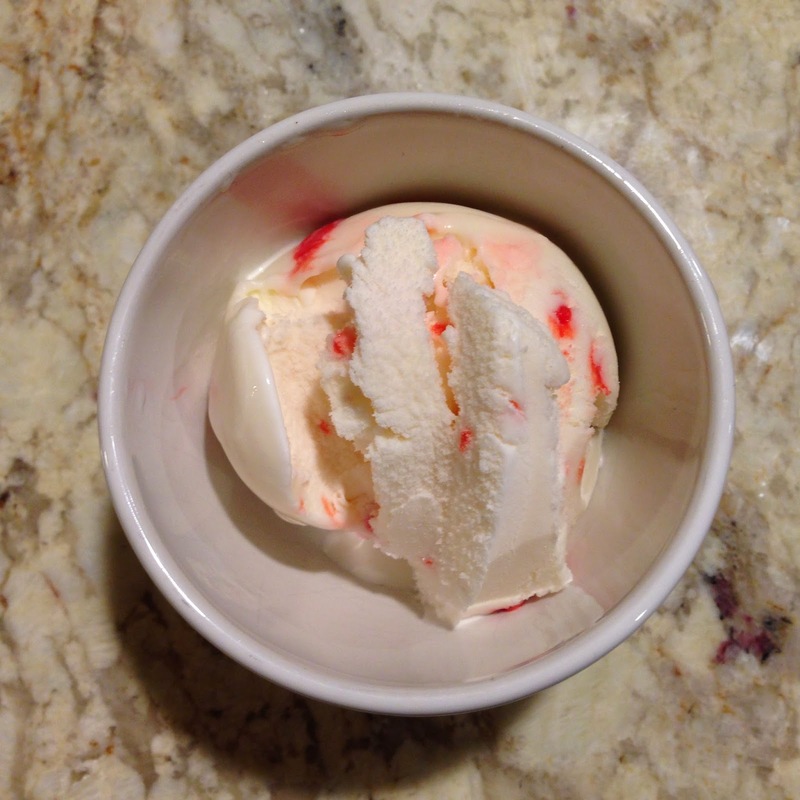 The ice cream was pretty -- white with bright red spots mixed throughout. The was mellow and sweet and very enjoyable. What I didn't like was the end -- the aftertaste of candy canes. But this is me. I already said I don't like candy canes. But if you like candy canes, this sure is the flavor for you. And even if you don't like candy canes, it would probably be a good date ice cream, because it leaves your breath minty fresh! Long story short, it wasn't bad. It was good. It just would have been better had I actually liked candy canes. And if it were out of production, it wouldn't be the one I voted to bring back. Speaking of which, did you vote to bring back a Brigham's flavor? Do it while you still can! And then head back over to Scoopalicious, let us know which flavor you chose in our comments section, fill out the Rafflecopter form, and be entered to win one of ten Sundaes-in-a-Box! Just a few notes for our readers! There is still time to enter to win a Sundae-in-a-Box courtesy of Brigham's Ice Cream. Please head over to our post from Sunday to see how to enter! Raffle ends at the end of the day on Saturday, so don't wait! Since the Sundae-in-a-Box includes a coupon for Brigham's Ice Cream, which is only available in New England, this giveaway is only open to readers in ME, NH, VT, MA, CT or RI. However, if you wish to play and you are not in one of these states, you may request that we send your prize to a friend or family member in New England. Good luck! Please be sure to leave a comment AND fill out our Rafflecopter form so you are eligible to win. If you haven't done one or the other, please feel free to go back in and do so! As you can see from my post on Sunday, my Sundae-in-a-Box arrived from Brigham's last week and with coupons and toppings, so I told my daughter (V) we were having sundaes for dessert and we headed to the store to pick up ice cream. I really like Brigham's ice cream, despite the fact that they keep getting rid of my favorite flavors. Vanilla Bean, plain and simple. And that's not a bad thing. What I don't like is the limited stocking at my favorite stores. I went to my local Shaw's and I had the following flavors to choose from: Chocolate, Vanilla, Vanilla Bean, Mocha Almond, Coffee, and Peppermint Stick. My husband went to our local Price Chopper and he found Chocolate, Vanilla, Vanilla Bean, Salty Caramel Crunch, Coffee, and Peppermint Stick. Yes. Seven limited flavors total in two stores -- only one flavor wasn't the same in each store. I don't like coffee flavoring and I don't really like candy canes, so that left me with vanilla, vanilla bean, and chocolate to choose from on my trip. 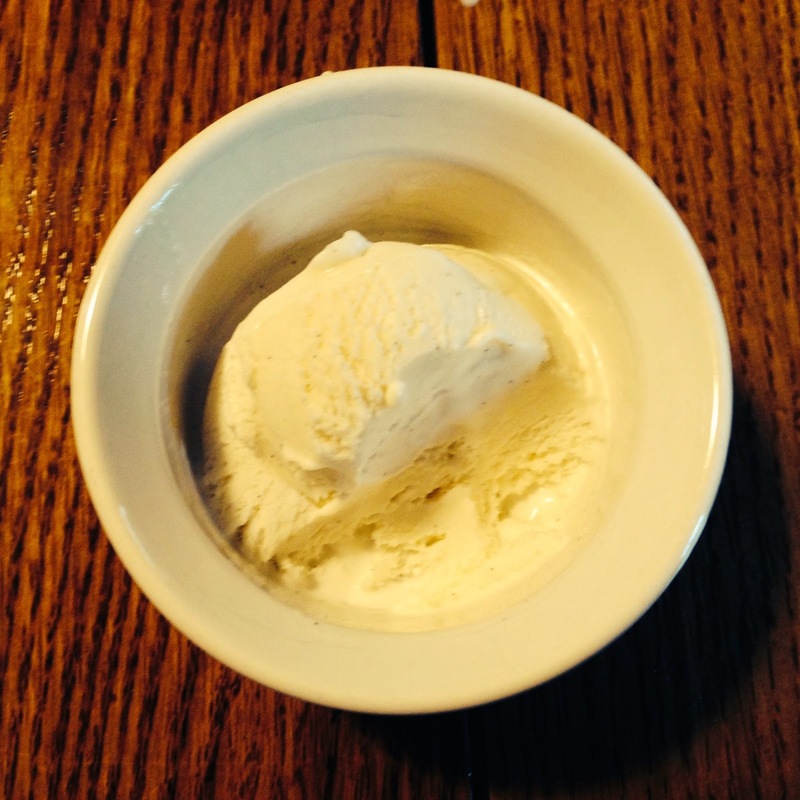 I guess truth be told, I think vanilla is the best base for a sundae. First I tried the Vanilla Bean alone. It was nice and light, and had a nice vanilla flavor. It was creamy and had the beautiful specks of Vanilla Bean in it. It did not compare to my favorite vanilla ice cream...Brigham's no-longer-existing French Vanilla. It did not have that rich custard flavor I loved in the French Vanilla. But that aside (since it's not one I can bring back with Brigham's flavor contest) the Vanilla Bean was really a nice flavor and made an excellent base for sundaes. Nor was I when I had it plain or a few days later topped it with peanut butter sauce and whipped cream. Want to try this flavor or another Brigham's favorite? 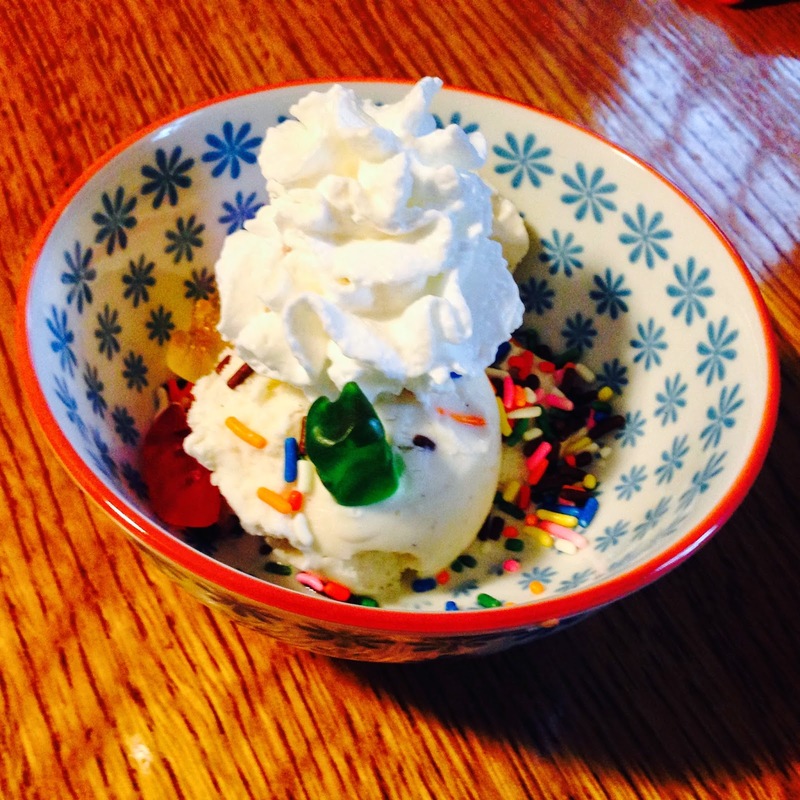 Head over to our post from Sunday and enter to win your own Sundae-in-a-Box from Brigham's! Part of Brigham's 100 year celebration is a "memory look-book" on their website. It may have been The Big Dig I went home with. My first experience with Brigham's was at the Scooper Bowl thirteen years ago. I lived in Boston's North End. I was just leaving the Scooper Bowl after attending with my co-interns from Houghton Mifflin, and a woman walked by with a container of Brigham's. She told me the people at the Brigham's booth had given it to her, but there was no way she was making it home without it melting -- would I like it? Government Center where the Scooper Bowl was being held was a short walk from my North End apartment, so I gladly carried the container home. I'd like to be able to tell you I remember the flavor, but I can't. 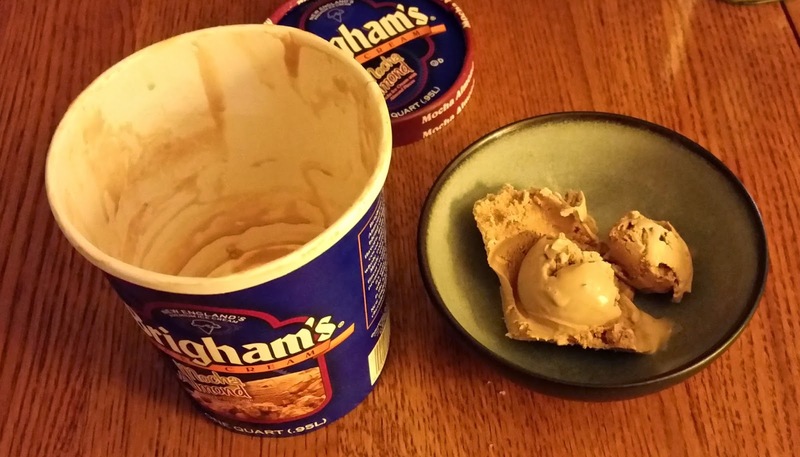 I can tell you that by the time I got home, it was perfectly softened, and dinner that night was my first (and perfect) taste of Brigham's Ice Cream. I'm smiling and thinking of dear friends as I remember other times...eating at the Brigham's in the Financial District or eating Brigham's on the newly developed Greenway when I worked downtown. I also remember some great birthday parties over Brigham's ice cream cakes in the office where Tina and I met. (Those were some of our favorite days there, huh, Tina?!) That cookie crust was to die for. I think Tina and I may have sealed our friendship over that cake and our shared love of ice cream! I'm kind of wordy, so my memory doesn't fit on their form, but make sure yours does so you have a chance to win an ice cream scoop from Brigham's! While you are there, vote for the ice cream flavor you'd like Brigham's to bring back, then swing back over to our post from Saturday to leave a comment telling us which flavor you voted for and fill out our form for our rafflecopter giveaway for a Sundae-in-a-Box! Happy 100 Years, Brigham's Ice Cream! Scoopalicious is pleased to be part of the celebration as Brigham's Ice Cream celebrates their 100th Anniversary! Brigham's announced that "since 1914, Brigham’s has been Boston’s favorite ice cream and a part of countless memories. Today, its rich, creamy flavor continues to be enjoyed in homes across New England more than ten decades later." Brigham's is celebrating in their own way with an online "memory look-book" and a chance to vote for your favorite Brigham's "throwback flavor" to be announced in July and brought back into production in 2015! We at Scoopalicious are also partnering with New England's beloved ice cream company with some flavor reviews and ten Sundae-in-a-Box giveaways! Let us know what flavor you voted for and be entered to win one of ten Sundaes-in-a-Box! Check back in this week for some of our thoughts on Brigham's flavors and some of our own Brigham's memories! For more information about the 100th anniversary visit www.brighams.com. Last month we got an email from someone at yolli.com asking if we'd like to try out their confectionery supplies. I'd never heard of them, so I followed the link, perused the site, and found they had ice cream supplies. But of course we would! The site is out of the UK and so there were actually some items they were offering for sale that I had never heard of, including honeycomb pieces. 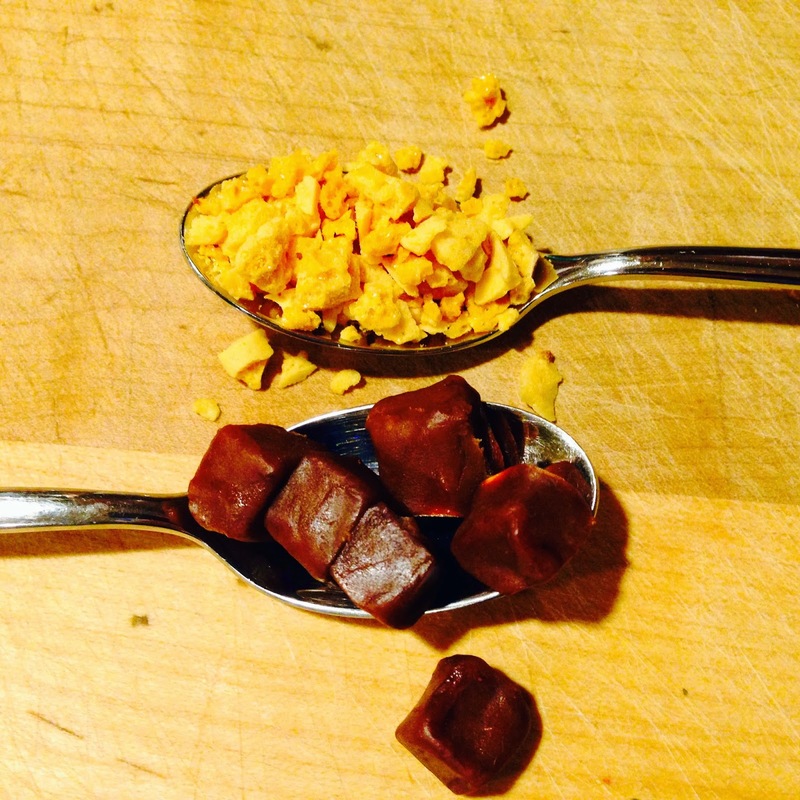 I asked my contact if she would mind sending me the honeycomb pieces and the chocolate brownie fudge cubes. She kindly obliged and a few weeks later I came home to a package of ice cream mix-ins. I doubled a nice chocolate base from The Ciao Bella Book of Gelato and Sorbetto: Bold, Fresh Flavors to Make at Home , divided the base, and froze each half with each of the mix-ins so I could try them out. The honeycomb pieces, to begin with, aren't honeycomb or honey at all. Upon further research, I found these honeycomb pieces are actually a crumbled version of a type of toffee also known as sponge toffee or cinder toffee. Honeycomb toffee is a mix of sugars and baking soda, giving it a very airy feel, and a spongy or pumice-y look, as one might imagine. It somewhat reminded me of peanut brittle without the peanuts. It was sweet with a hint of that baking soda taste. Mixing it in had interesting results. When I took the ice cream directly out of my machine, the honeycomb pieces had a nice crunch to them in the ice cream. However, after I put the ice cream in the freezer to ripen, and then scooped some, the honeycomb had dissolved, leaving only darker, sweeter spots of chocolate (see picture.) It wasn't bad, just not much of anything. The fudge bits didn't do as much for me. They kind of reminded me of Tootsie Rolls. They gave a nice chewy texture to the mix-ins, but overall the taste wasn't too exiting to me, and the chocolate flavor wasn't as chocolately as the ice cream actually was, which was surprising with the fudge name. Final verdict? While Yolli isn't known for it's ice cream supplies, but more for it's candy making supplies, I am not sure they would be my first stop shop for ice cream making, but I certainly wouldn't discount them for candy making. (Quite honestly, when I first went to their site, I was wishing I had a candy or baking blog so I would have an excuse to ask for samples of the cookie cutters or candy floss (aka. cotton candy) supplies or many of the other various supplies (ah, in my next blog/lifetime). Thank you Yolli for the fun supplies and the excuse to make some new and interesting ice cream flavors! And P.S. your site is incredibly fun and bright and makes me feel like a kid in a candy shop!